Died June 7, 2004 I was there the moment you were conceived, the moment you took your first breath of air and the moment you took your last breath. Thank you for all those precious moments in between you will never be forgotten. Whiskey was the leader of the Whiteshadow Kennel family after the death of Sambuca. 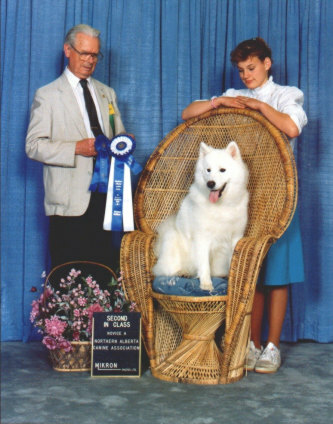 Like her Mother, Sambuca she too has produced some of top Samoyed puppies in Canada. She was our watchdog...always first to insure that visitors are quality inspected and then welcomed. She retired from the breeding program and supervised the rest of the pack until her death.